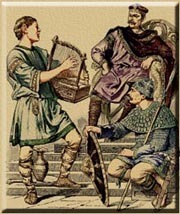 Beowulf is given four gifts and the poet says that he’d never seen or heard of anyone receiving such gifts ever before. Some of you probably think that all of these commentaries making mountains out of molehills. The tiny nuances of a language long dead can hardly hold any meaning that could possibly be relevant to today, and to try and draw meaning out of Beowulf is like trying to get water from a well that’s been dry for years. But poetry is poetry. When it’s read all the meaning packed into it comes out. Old poetry’s just in need of a few drops of water to restore it, like something dried out to preserve it. And this entry’s passage practically makes its own sauce once you’ve added a few drops of water. Because this entry’s passage is the site of a decades long controversy. In line 1020, we’re told that “the sword of Halfdane” (“brand Healfdenes”) is the person who gives Beowulf the gifts featured in this passage. Or is it “the son of Halfdane” (“bearn Healfdenes”)? Seamus Heaney’s text (published in 2001) uses the latter reading of the original manuscript, while C.L. Wrenn’s somewhat older version (published in 1958) goes with the former. Now, I’m not about to dive into a mess of orthography and manuscript analysis because I don’t think I’m qualified to do so after so much time away from formal academia. But I am going to point out one major thing about this discrepancy. It’s a small detail, but whether the poem refers to Hrothgar as “the sword of Halfdane” or “the son of Halfdane” makes a big difference in the matter of the passage’s tone. As the word “feoh-gift” (which I’ve translated as “largesse” (l.1026)) signifies, this is a very important giving of gifts since there’s a sense of a strong bond being formed (akin to marriage – then still primarily a business/financial matter more than one of love, so there’s a sense of legality, or formality here). But whether it’s “the son of Halfdane” — his heir and descendant — doing the giving or “the sword of Halfdane” — his general and foremost warrior — tells us about the nature of that bond. I think. If we take the reference to be to Hrothgar’s being the son of Halfdane, then the bond seems much more familial, as if Beowulf is being welcomed into the family of Hrothgar, whatever that might involve. At the very least, you’d think that a family would be closer than something like a war chief’s comitatus. Also, if you read the reference to Hrothgar as “the son of Halfdane,” then the bond the gifts signify seems to be more one of strengthened trust than anything else. Beowulf was entrusted with the hall — was legally made its owner — over the course of the night and he handled it well. So he’s proven that he can measure up to his word, and as such can be trusted. But, if Hrothgar is supposed to be the sword of Halfdane here, then it paints the giving and the bond that comes with it as something that’s much more martial. Hrothgar could be seen as one making a political alliance with a figure that has proven himself strong beyond belief and definitely a force that you wouldn’t want to face in battle. So the four gifts given by the sword of Halfdane become the basis of an alliance of Beowulf (and by extension, the Geats) with Hrothgar. Perhaps this bond is even a continuation or renewal of the older man’s relationship with Beowulf’s father. Actually, these two readings leave us with a kind of dichotomy. On the one hand the martial alliance is made perhaps out of fear or calculation, while on the other the familial bond comes from something more personal and made out of respect and trust. Figuring this out would be much easier, I think, if the “jewelled sword” of line 1023 were a little more specific. At least in so far as it’s the most described treasure, so if we knew if it was practical or just decorative could lend itself to either reading. Given what Beowulf’s done for the Danes up to now, which do you think makes more sense – Hrothgar bringing Beowulf into the family, or Hrothgar making a more formal political alliance with Beowulf and the Geats? One of the things that makes poetry interesting is variety. Whatever the frequency of compound words might mean, Beowulf just wouldn’t be as interesting if there was a very obvious pattern to them; like if the poet always used complex compounds while characters like Beowulf and Hrothgar only did so while boasting. This passage spoken by the poet keeps the use of compounds fresh since it’s got a mix in it that leans more to the simpler side. First up is line 1022’s “hilde-cumbor,” a “war banner” and one of the gifts given to Beowulf. This compound is a straight up combination of the words “hilde” (“war,” or “combat”) and “cumbor” (“sign,” “standard,” or “banner”) that means exactly that: a “war banner.” Not much to say here since this is very much a compound of function. Once again, the poet throws words together simply because the poet can on line 1023. The word “maðþum-sweord” is another compound of function since its meaning of “costly sword,” or “ornate sword” comes pretty directly from the combination of “maðm” (“treasure,” “object of value,” “jewel,” “ornament,” or “gift”) and “sweord” (“sword”). Now, which of the meanings of “maðm” you go with can determine the sort of import of the sword in question, but there’s not a lot of wiggle room in interpreting this word. Maybe reading this compound as referring to a “gift” sword is the same as considering it a “jewelled sword” or a “treasure sword.” After all, praiseworthy gifts are often decked out. Now, line 1026’s “feoh-gift” is where this passage’s words get interesting. On its own, the word “feoh” means “cattle,” “herd,” “movable goods,” “property,” “money,” “riches,” or “treasure,” and the word “gift” means “gift,” “portion,” “marriage,” “gift,” “dowry,” “nuptials,” or “marriage.” So this compound definitely refers to a very valuable gift, but the heavy implication of a bond as strong as marriage makes anything called a “feoh-gift” more than just trinkets exchanged because of a job well one. These gifts are meant to seal a bond between Hrothgar and Beowulf, to somehow ally them. So this word is quite well chosen. But, given the word’s context, the poet uses “gum-manna” to suggest that these men are exemplary. That they’re shining examples of what a man should be. That’s the sort of emphasis that word doubling usually lays on a thing in Old English, after all. Which brings us around to a compound that’s neat for unexpected reasons. This is 1029’s “ealo-benc,” meaning “ale bench.” This compound, unsurprisingly, comes from combining the words “ealu” (“ale,” or “beer”) and “benc” (“bench”) together. What makes it neat, though is that the poet hangs quite a bit of meaning on this word. Either the poet’s using a single ale bench as a metonymy for all halls everywhere, or the poet’s getting super specific and saying that he’s never heard of anything like this happening on any ale bench – ever. Which do you find more interesting, practical compounds like “hilde-cumbor” or more nuanced ones like “feoh-gift”? In the next entry, the gift giving continues as Hrothgar hands over some more gear and a few horses. This entry was posted in Beowulf, Old English, poetry, translation and tagged Anglo-Saxon, Beowulf, Hrothgar, Old English, Seamus Heaney, treasure by NSCZach. Bookmark the permalink.